The workshop will be a computer lab, in which the participants will be able to ask questions and interact with the instructors. Students will work through an Rmarkdown document while the instructors respond to any questions they have. The plyranges package is a domain specific language (DSL) built on top of the IRanges and GenomicRanges packages (Lee, Cook, and Lawrence (2018); Lawrence et al. (2013)). It is designed to quickly and coherently analyse genomic data in the form of GRanges objects (more on those later!) and from a wide variety of genomic data file types. For users who are familiar with the tidyverse, the grammar that plyranges implements will look familiar but with a few modifications for genomic specific tasks. The grammar that plyranges develops is helpful for reasoning about genomics data analysis, and provides a way of developing short readable analysis pipelines. We have tried to emphasise consistency and code readability by following the design principles outlined by Green and Petre (1996). One of the goals of plyranges is to provide an alternative entry point to analysing genomics data with Bioconductor, especially for R beginners and R users who are more familiar with the tidyverse approach to data analysis. As a result, we have de-emphasised the use of more complicated data structures provided by core Bioconductor packages that are useful for programming with. This workshop is intended for new users of Bioconductor, users who are interested to learn about grammar based approaches for data analysis, and users who are interested in learning how to use R to perform analyses like those available in the command line packages BEDTools (Quinlan and Hall (2010)). If that’s you, let’s begin! Figure 4.1: An illustration of a GRanges data object for a single sample from an RNA-seq experiment. The core components of the object include a seqname column (representing the chromosome), a ranges column which consists of start and end coordinates for a genomic region, and a strand identifier (either positive, negative, or unstranded). Metadata are included as columns to the right of the dotted line as annotations (gene-id) or range level covariates (score). The plyranges package is built on the core Bioconductor data structure GRanges. 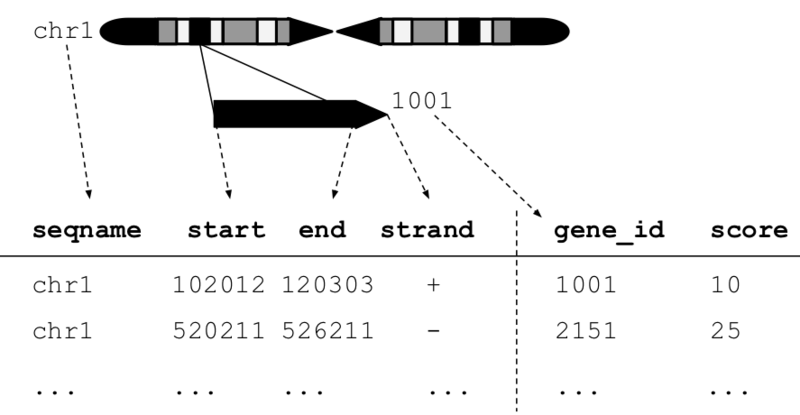 It is very similar to the base R data.frame but with appropriate semantics for a genomics experiment: it has fixed columns for the chromosome, start and end coordinates, and the strand, along with an arbitrary set of additional columns, consisting of measurements or metadata specific to the data type or experiment (figure 4.1). GRanges balances flexibility with formal constraints, so that it is applicable to virtually any genomic workflow, while also being semantically rich enough to support high-level operations on genomic ranges. As a core data structure, GRanges enables compatibility between plyranges and the rest of Bioconductor. The as_granges method takes a data.frame and allows you to quickly convert it to a GRanges object (and can you can also specify which columns in the data.frame correspond to the columns in the GRanges). A GRanges object follows tidy data principles: it is a rectangular table corresponding to a single biological context (Wickham (2014)). Each row contains a single observation and each column is a variable describing the observations. In the example above, each row corresponds to a single gene, and each column contains information about those genes. As GRanges are tidy, we have constructed plyranges to follow and extend the grammar in the R package dplyr. Here we provide a quick overview of the functions available in plyranges and illustrate their use with some toy examples (see 12.11 for an overview). In the final section we provide two worked examples (with exercises) that show you can use plyranges to explore publicly available genomics data and perform coverage analysis of BAM files. The plyranges grammar is simply a set of verbs that define actions to be performed on a GRanges (for a complete list see the appendix). Verbs can be composed together using the pipe operator, %>%, which can be read as ‘then’. Here’s a simple pipeline: first we will add two columns, one corresponding to the gene_type and another with the GC content (which we make up by drawing from a uniform distribution). Second we will remove genes if they have a width less than 400bp. The mutate() function is used to add columns, here we’ve added one column called gene_type where all values are set to “ORF” (standing for open reading frame) and another called gc_content with random uniform values. The n() operator returns the number of ranges in GRanges object, but can only be evaluated inside of one of the plyranges verbs. Now that we have some measurements over our genes, we are most likely interested in performing the favourite tasks of a biological data scientist: taking averages and counting. This is achieved with the summarise() verb which will return a DataFrame object (Why is this the case?). We have seen how you can perform restriction and aggregation on GRanges, but what about specific actions for genomics data analysis, like arithmetic, nearest neighbours or finding overlaps? Note that the anchoring modifier introduces an important departure from the IRanges and GenomicRanges packages: by default we ignore the strandedness of a GRanges object, and instead we provide verbs that make stranded actions explicit. In this case of anchoring we provide the anchor_3p() and anchor_5p() to perform anchoring on the 3’ and 5’ ends of a range. The table in the appendix provides a complete list of arithmetic options available in plyranges. You may have noticed that the resulting range are now unstranded, to take into account stranded features use the directed prefix. Another important class of operations for genomics data analysis is finding overlaps or nearest neighbours. Here’s where we will introduce the plyranges join operators and the overlap aggregation operators. Now let’s now suppose we have some additional measurements that we have obtained from a new experiment on yeast. These measurements are for three different replicates and represent single nucleotide or insertion deletion intensities from an array. Our collaborator has given us three different data.frames with the data but they all have names inconsistent with the GRanges data structure. Our goal is to unify these into a single GRanges object with column for each measurement and column for the sample identifier. Another option would be to perform a join operation. A join acts on two GRanges objects, a query and a subject. The join operator retains the metadata from the query and subject ranges. 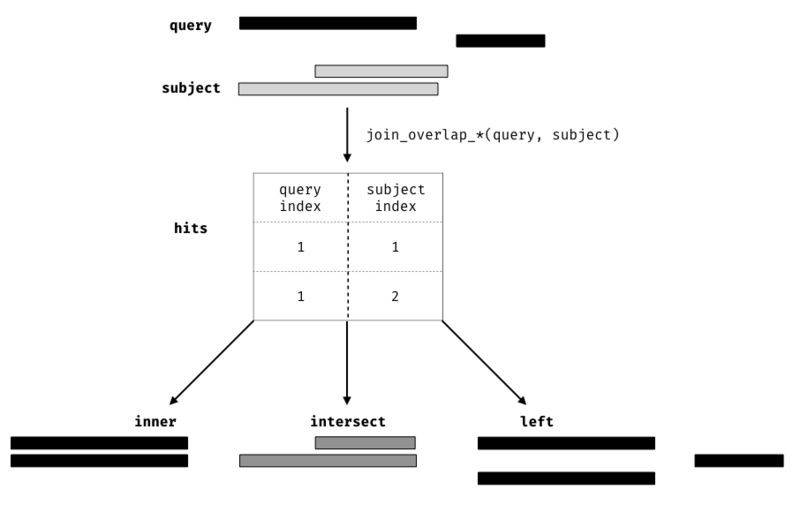 All join operators generate a set of hits based on overlap or proximity of ranges and use those hits to merge the two datasets in different ways (figure , provides an overview of the overlap joins). We can further restrict the matching by whether the query is completely within the subject, and adding the directed suffix ensures that matching ranges have the same direction (strand). Figure 12.1: Illustration of the three overlap join operators. Each join takes query and subject range as input (black and light gray rectangles, respectively). An index for the join is computed, returning a Hits object, which contains the indices of where the subject overlaps the query range. This index is used to expand the query ranges by where it was ‘hit’ by the subject ranges. The join semantics alter what is returned: for an join the query range is returned for each match, for an the intersection is taken between overlapping ranges, and for a join all query ranges are returned even if the subject range does not overlap them. This principle is gnerally applied through the plyranges package for both overlaps and nearest neighbour operations. If we wanted to return all intensities regardless of overlap we could use the left join, and a missing value will be propagated to the gene_id column if there isn’t any overlap. There are of course many more functions available in plyranges but hopefully the previous examples are sufficient to give you an idea of how to incorporate plyranges into your genomic workflows. Here we provide some realistic examples of using plyranges to import genomic data and perform exploratory analyses. In the workflow of ChIP-seq data analysis, we are often interested in finding peaks from islands of coverage over a chromosome. Here we will use plyranges to explore ChiP-seq data from the Human Epigenome Roadmap project Roadmap Epigenomics Consortium et al. (2015). To find out the name of the sample corresponding to primary memory T-cells we can filter the data.frame. We extract the sample ID corresponding to our filter. We have our desired BigWig files so now we can we can start analysing them. For this analysis, we will call peaks from islands of scores over chromosome 10. First, we extract the genome information from the first BigWig file and filter to get the range for chromosome 10. This range will be used as a filter when reading the file. Then we read the BigWig file only extracting scores if they overlap chromosome 10. We also add the genome build information to the resulting ranges. This book-keeping is good practice as it ensures the integrity of any downstream operations such as finding overlaps. We can then filter to find the coordinates of the peak containing the maximum score for each signal. We can then find a 5000 nt region centred around the maximum position by anchoring and modifying the width. Finally, the overlap inner join is used to restrict the chromosome 10 coverage islands, to the islands that are contained in the 5000nt region that surrounds the max peak for each signal type. Use the reduce_ranges() function to find all peaks for each signal type. How could you annotate the scores to find out which genes overlap each peak found in 1.? Plot a 1000nt window centred around the maximum scores for each signal type using the ggbio or Gviz package. A common quality control check in a genomics workflow is to perform coverage analysis over features of interest or over the entire genome (again we see the bioinformatician’s love of counting things). Here we use the airway package to compute coverage histograms and show how you can read BAM files into memory as GRanges objects with plyranges. For RNA-seq experiments we are often interested in splitting up alignments based on whether the alignment has skipped a region from the reference ( that is, there is an “N” in the cigar string, indicating an intron). In plyranges this can be achieved with the chop_by_introns(), that will split up an alignment if there’s an intron. This results in a grouped ranges object. To begin we can read the BAM file using read_bam(), this does not read the entire BAM into memory but instead waits for further functions to be applied to it. Compute the total depth of coverage across all features. How could you compute the strand specific genome wide coverage? Create a workflow for computing the strand specific coverage for all BAM files. For each sample plot total breadth of coverage against the number of bases covered faceted by each sample name. The grammar based approach for analysing data provides a consistent approach for analysing genomics experiments with Bioconductor. We have explored how plyranges can enable you to perform common analysis tasks required of a bioinformatician. As plyranges is still a new and growing package, there is definite room for improvement (and likely bugs), if you have any problems using it or think things could be easier or clearer please file an issue on github. Contributions from the Bioconductor community are also more than welcome! Overview of the plyranges grammar. The core verbs are briefly described and categorised into one of: aggregation, unary or binary arithmetic, merging, modifier, or restriction. A verb is given bold text if its origin is from the dplyr grammar.